To her credit, Meghan McCain – the lone conservative co-host on the show – disputed Ms. Behar’s diagnosis and claimed that Jesus speaks to her every morning. The public ridicule and mockery of Christians is sad … but growing. But they aren’t speaking in audible “voices” as Ms. Behar falsely assumes. On the contrary, the apostle Paul, whom God used to write a large portion of the New Testament, was one of the most highly educated scholars of all time. He was intimately familiar with Greek and Roman history, culture and philosophy – as well as Jewish history and culture. Instead of investigating the truth claims of Christianity, many simply assume that it’s false and label Christians as having a psychiatric disorder. 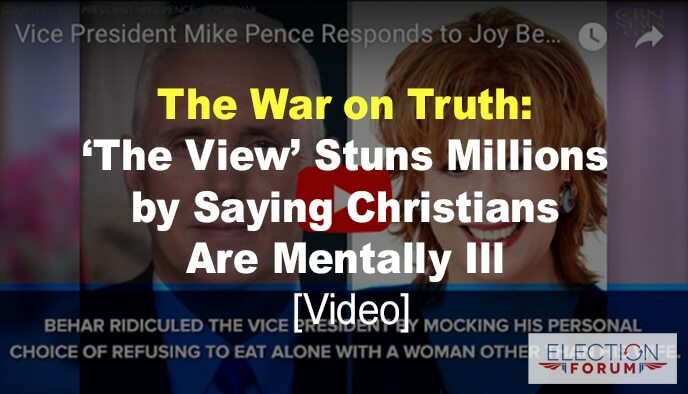 It was a shocking insult that joy behar would make on national TV. I occasionally tune into the View, but now I will never watch it. It was disrespectful to people of Faith. But….. it should not surprise us…. we are to address it and move on.